Be the first to share your favorite memory, photo or story of Irving Williams. This memorial page is dedicated for family, friends and future generations to celebrate the life of their loved one. 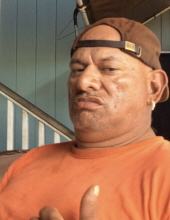 Kimo Zablan, 52, of Lāna`i passed away on October 30, 2018 in Honolulu. He was born in Kaunakakai, Molokai. Survived by wife, Michele Zablan; sons, Israel (Krista) Zablan, Lord Maka`ike Zablan; daughters, Leinani Zablan, Kamalani Zablan (Deceased), Iolani (Elfred) Zablan, & Kahelelani Zablan; 4 Grandsons, Niko (8 years), Nainoa (5 years), Tahlyn (2 years), & Kaleb (1 year). Visitation will be from 5:00 p.m., Saturday, November 24th, 2018 at the Nu`uanu Memorial Park & Mortuary, East Chapel. Service begins at 6:00 p.m and refreshments to follow. Our `Ohana would also like to invite you to join us at Our Homestead on Lana`i to Celebrate His Life on Saturday, December 1st, 2018 at 11:00 a.m.
To send flowers or a remembrance gift to the family of Irving Williams Kimo Zablan, please visit our Tribute Store. "Email Address" would like to share the life celebration of Irving Williams Kimo Zablan. Click on the "link" to go to share a favorite memory or leave a condolence message for the family.